The Bhajan continued constantly during Mahasivarathri, the Divine Night. The next morning Baba spoke on the significance of the vigil of the fast, and on the value and auspiciousness of Bhajan. Then, He Himself distributed the consecrated food with which the fast is to be broken. The morning marks the close of the celebrations. But the crowd of over 25.000 persons does not depart so soon, as they wait for the chance to touch the Lotus Feet and to get a share of the Holy Ash, which had been miraculously created for Abhisheka (surprise gift) on the Sacred Day. So, Baba goes through the meandering lines of squatting men and women, slowly and smilingly, giving each one a packet or two of the curative ash! He autographs a portrait of His here and there when some ardent seeker stands up to get that sign of Grace; He touches at the big packets of Vibhuti which devotees desire to take home, charged with curative potency by that contact; He pronounces the welcome word, 'Santhosham' or 'Accha' or 'Very Happy', so that they could move away, satisfied that they have had Darsan, Sparsan and Sambhashana (seeing Him, touching Him and listening to His Voice). Many have traveled in crowded trains, from long distances into a State which speaks a different language, and undergone huge expenses, and gone through physical strain. But these, as well as the sun and the cold, the open sheds and the tree shades where they had to spend the days at Puttaparthi, were forgotten of or even welcomed, when Baba looked at them or smiled at them or patted them or gave them the precious lump of food or the coveted pinch of Vibhuti. Others stay on, hoping that Baba will call them for a private talk! They spend the whole day, sitting in front of the Nilayam, in lines facing each other, for the off-chance that Baba might come any moment and call them in for a private interview. Baba is considerate. He spends more hours than usual in a task of ministration. He selects at first the patently ill - the paralytics, the polio-affected, the arthritis patients who sit on chairs, the wheelchair occupants, those with crutches, artificial limbs, plasters and bandages, and those suffering from chronic illness. He also selects the old, the blind, the defective and the feeble minded. This takes at least two or three days, and so, one evening, Baba usually announces that those who have urgent work in their own places either in offices or factories or commercial establishments or farms need not wait for His formal permission to go, but can take the announcement itself as permission with blessings. Since He is traveling home with each of them and remaining with each of them and working with each of them in farm or factory, they need not feel that they are going away or that Baba is not by their side. This announcement persuades a large number to leave; but many wait on! "They are all my people; My Kith and Kin, come for Me," Baba acknowledges. From early dawn till deep into night, Baba is busy for more than ten or twelve days, curing, consoling and counseling, either individually or as families or in groups from each town or state, so that the gathering gradually melts and leaves in high spirits, light, full of courage and joy, with a confident gait and a firmer step. The number of visitors gets lessened in about a week, and after bestowing His blessings upon them all, Baba leaves for Brindavan, Whitefield, 12 miles away from Bangalore. The summer months of March and April He spends there, so that devotees may not suffer the piercing sun at Puttaparthi. Brindavan is a cool comforting garden, with an imposing bungalow situated at one end, within an inner gate. Devotees gather here too, and engage themselves in Bhajan under a vast shady tree. Baba comes out of the bungalow - a beam of charming sunshine - whenever He realizes that people have been waiting too long, and slowly moves among the lines of adoring, anxious, avid aspirants for Grace. He sheds benediction and joy on all. From dawn to dusk, here too, Baba gives His time and energy to those who seek health, happiness, and wholesome spiritual guidance from Him. Dharmakshetra was established in Bombay, on May 12th, 1968 [see also: Attention world at prayer]. It is the center where Sanathana Dharma, as well as its offshoots and progeny, Buddha-Dharma, Jaina-Dharma, Islam-Dharma, Zoroaster-Dharma and Christ-Dharma are respected, and their followers find friendship and fellow-feeling amongst each other. It has also proved to be a source of joy to the devotees in Bombay as Baba visits Bombay during the second week of May every year, when the City celebrates its epochal event, conferring the boon of further spiritual advice. Baba arrived in Bombay on the 8th May, and until the 12th, He was the cynosure of all eyes, the Figure on whom all affixed their minds, the subject of conversation in thousands of homes. The Bhajan Sessions at Dharmakshetra were thrilling experiences for tens of thousands of eager participants, both in the morning and evening hours. Baba met sizeable groups of teachers and principals one evening, Rotarians and Lions another day, and Sadhakas another evening. To the Sadhakas, He spoke of such matters as how to hold and roll the rosary, the significance of the number 108, the chanting of Soham as a continuous psychic discipline, and the verity inherent in variety. To the Rotarians, He spoke of the utter ridiculousness of imitating the culture of America, a malady that is fast spreading its maleficence in India, rich in her own invaluable traditions. "Some people hear through American ears, see through American eyes, and think through the American brains that they have transplanted into themselves," He said. History, climate, vegetation, language, neighbouring cultures, alien influences and foes - all shape and mould the cultural trends of a people. Indiscriminate adoration and imitation tend to destroy individual and social peace, He warned. To the teachers, He spoke of the spacious mansion of religion erected by the sages to provide peace, prosperity and contentment. He exhorted them to study the basic principles of religion and apply them in their own lives. "A teacher must be an example of happiness and joy chiseled by attachment to God and detachment from worldly greed. Then alone can he be a person worthy of his job," He said. Dharmakshetra is a Jnanavahini ('stream of spiritual wisdom'; for further reading, see Jnana Vahini), in brick and mortar! The entrance door of the Sathyadeep, the Prayer Hall, has embossed on it in polished brass, the symbols sacred to every religion: the Pranava (OHM), the Cross, the Crescent and Star, the Conch, the Wheel, the Flame, the mystic letter Sri and the Chalice. It proclaims, "Every religion is a lamp that illuminates the path of truth; every religion traverses the region (Kshetra) of Dharma (Righteousness);" that is the message with which man is greeted here. As you enter, there shines facing you, the lamp, in answer to man's eternal prayer: Thamaso maa Jyothirgamaya: From darkness, lead me unto Light. And on both sides of the lamp, held aloft by the hands of devotion drawn as a fresco on the wall, we have symbols of the Five elements, the components of the Universe, the primordial substance of Brahman. * Akash, Ether or Sky, cognizable only through one sense, having only sound. On the other side, we have symbols of Sathya, Dharma, Santhi, Prema and Ahimsa, resp. the Jnana-mudra, the Oil Lamp, the Lotus, the Moon and the Palms folded in Prayer. In the Prayer Hall, half way up the ridge, Baba has got painted the Âtmâ Ramâyana [for further reading on the Ramâyana, see the Ramakatha Rasavahini] and the Âtmâ Mahâbhâratha [see Vahini-links], reinterpreting the great epics into lessons on the fundamental steps in the Sadhana for self-realization. His discourse, therefore, on the Anniversary of the Inauguration Day was on the message that the Building trumpets forth: "The human body is the Kshetra: it has to be transmuted into the Dharmakshetra! When the owner of the body discards desire, passion, injurious impulse, and pernicious propulsions, then the body is Dharmakshetra." On the 15th, Baba flew to Ahmedabad, the biggest city in the Gujarat State; the chief justice of the High Court, Gujarat State, had arranged a reception, at which the governor, the chief minister and other ministers had come; they got a chance to know Baba's universal outlook, and His emphasis on the fundamental unity of all faiths. In the evening Baba addressed a mammoth gathering for over an hour. "Yoga and Thyaga are two chief instruments of spiritual progress. By Thyaga (detachment) you escape from pathetic entanglement with the objective world; by Yoga (self-control) you attach yourself to the Divine Principle that is immanent in the universe, in truth, beauty and goodness wherever found," He said. "I bless you that you succeed in the Sadhana in which you are engaged; if you are not practicing any now, I advise you to take up the simple preliminary step of Namasmarana, reciting or singing the Name. Also, reverence towards parents, teachers, elders and service to the poor, the sick, the deserted, the distressed, the defectives. See in every one, God, in that disguise, come, to accept the offering of Love you place at their Feet," Baba declared. Gujarat, already resounding with the sweetness and purity of Sai Bhajan in every village and town, received a great big spurt by this visit. On the 14th of June, during a meeting at the residence of the Minister for Agriculture, Sri P.K. Sawant, when the members of the Maharashtra Branch of the Prasanthi Vidwanmahasabha had gathered to solve from Baba many dilemmas encountered during Sadhana and study, the Editor of 'Nava Kaal', a Gujarati newspaper, was also present. His paper was then running a series of articles on 'Miracles' and he desired to ask Baba about them and publish His answers. Baba graciously permitted him even encouraged him by His replies. "I know the background of your questions," He said, with a smile, in order to put him at ease. We must be thankful to the Editor, as well as to Sri P.K. Sawant, Sri T.S. Bharde, speaker of the Maharashtra Legislative Assembly, and others at that meeting who prodded Baba through appropriate questions, so that we have from Baba an authentic analysis of the meaning and significance of these 'miracles.' Many amateur Sadhakas and half-baked monks declare that miracles are sacrileges on God and they provoke divine anger and invoke divine punishment. One such person, when asked specifically about the 'miracles' of Baba replied in writing, "I do abhor the performance of miracles, be it Christ, Krishna or Sai Baba." "This opinion is shared by all the sensitive beings," he wrote, implying that those who do not share his abhorrence, like Suka, for example, are not 'great' Rishis. He continues his purblind pronouncement: "An integrated human being has a lot of power over the cosmic happenings, but, to interfere with the law of the divine is a sin." "Having learnt physics and chemistry for many years during my youth and having practiced physics and chemistry for many years later and taught them and learnt them while teaching, for a number of decades, I cannot understand any individual like you and me, or even like the best of men on this planet defying the laws of physics and chemistry and getting away with it!" Perhaps, it is this line of argument that made the person who 'abhorred miracles,' to write further, "There are historical moments when we have to interfere with the divine law, and for this, according to the law of the cosmos, the individual suffers." 'You cannot get away with it,' as Dr. Bhagavantham said! The man who abhors miracles is a popular exponent of Krishna's teachings. But, that does not hinder him from writing. "Krishna died of an arrow wound and Christ died in great agony on the Cross." So, the author seems to say, "Sathya Sai Baba! Beware!" Let us now listen to what Dr. Bhagavantham has to say. 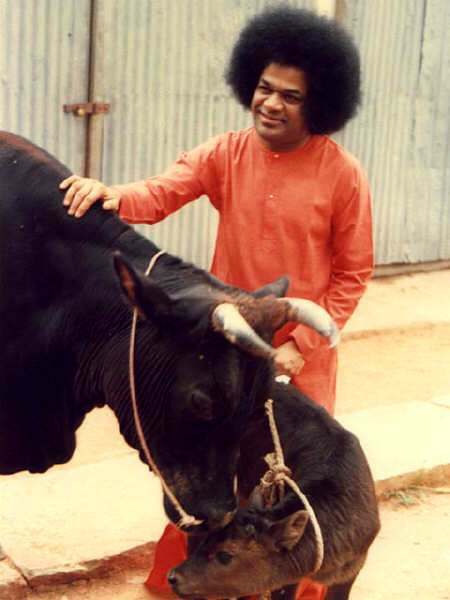 Does he accuse Baba of 'interfering' and warn Him of 'dire punishment,' as the arrow killed Krishna in vengeance for the Govardhangiri miracle and the Cross, for the loaves and fish, or the cures and visions? No. He is wiser than the monk. Dr. Bhagavantham says, "Baba went on breaking one law after another! I have asked His permission to tell you one or two of these happenings, for they are essential to establish my bona fides. I was an eye witness to a surgical operation which He performed. When it was over, He turned to my son who was present, and asked, "Have you got a length of bandage?" as if He who produced from nowhere the knife and the needle could not produce the bandage cloth! My son replied, "Yes! Father is the head of this Institute of Science; there is a dispensary here; I can telephone to the doctor, and get a bandage strip in two minutes." Bhagavan replied, "Oh! Two minutes is too long! Don't worry." Then, He waved His hand, and the bandage was ready for use! With due respect to the expertise of Professor Gokak in the use of the English language, I would have preferred him to say, instead of 'He defies the laws of physics and chemistry,' 'He transcends the laws of physics and chemistry'. Now, arguing further, with my training in the laboratory, and in logic, I cannot accept that He is like you and me and yet, He is transcending the laws of physics and chemistry. No, how can it be? The fact is, He is a Phenomenon... He is Transcendental... He is Divine." "This is a well-known feature of science. Science develops from stage to stage. Skeletons of discarded theories mark the road along which science progresses. A law is enunciated to explain known phenomena; when something comes up, inexplicable by known laws, the scientist takes that experience too; and that becomes another law. Since what I have seen of Baba, and what I am seeing, and what I no doubt will see, does not come under the known laws of science, I simply enunciate the law, "Bhagavan transcends the laws of science," and this becomes another law of science." "Some elders try to confuse you. Krishna showed many wonders, with an amazing disregard of the laws of nature and so, according to them, He had to meet death from the arrow of a hunter! Jesus, they say suffered crucifixion, for, He too manifested many miracles! Their argument is that, since I am defying the laws of nature, I too will suffer likewise! They hope to create panic and spread alarm. But, these are the prattlings of weakness, ignorance and envy. They cannot understand this Glory, nor do they desire to tolerate it!" "There are many who cannot bear to tolerate the splendour that emanates from Me, the Divinity expressed in and through every act of Mine. These people label them as acts of mesmerism, miracles or feats of magic! Their vocabulary is small. Their experience is limited. They hope by these words to cast a slur. Let Me tell you this: "Mine is no mesmerism, miracle or magic! Mine is genuine divine power. Small minds and limited intellects cannot comprehend them. They have no strength or stamina to grasp the magnificence and the majesty. God can do anything. He has all power in the palm of His hand. My body, like all other bodies, is a temporary habitation but My power is eternal, all-pervasive, ever-dominant." Sri Bharde who was in the group present when the Editor of 'Nava Kaal' interviewed Baba on this subject of miracles, had himself written a few weeks earlier in the same paper, "I have not so far seen any person who does miracles as naturally, as spontaneously as Sri Sathya Sai Baba. He stood before the idol of Rukmini at the famous shrine of Pandharpur, and waved His Hand saying, "The most important jewel is not found on the idol!" as He said so, a necklace of gold, the auspicious jewel, appeared concretized! That jewel which He then placed round the neck of the idol is still there! Sri Bharde asked Baba that day, "Is your power to create things, inexhaustible?" Baba answered, "It is limitless. It is as the ocean, inexhaustible. Every one wherever he is, whoever it be, can take from it whatever he needs, to his heart's content." At this, Hon'ble P.K. Sawant was emboldened to put in a query. "If it is inexhaustible, and limitless, why is it not used to cure the poverty and misery of mankind?" At this, Baba laughed outright, records the 'Nava Kaal': "You equate poverty and misery with the non-possession of things! Sovereigns can command all things that confer happiness and joy; but, are they content? Are they having mental peace? My task is to confer mental equanimity. I do not give things to people in order to make them richer: I give, in order to foster devotion and faith in them." Yes! A very rich business man told me, while showing a diamond ring created by Baba and placed by Him on his ring finger, (it fits exactly) "Mr. Kasturi whenever my eyes fall upon this ring and this big-sized diamond, I am reminded of the pregnant words with which Baba put it on my finger". "This is not a diamond; this is an Upadesh, a constant warning for you: Die Mind! Let the mind with all its likes and dislikes disappear, leaving you in peace." Baba told Sawant, "A sick person comes to Me. I give him something I create, Vibhuthi or some other article. He becomes conscious of divine power. He acquires mental peace, that cures, that comforts, that consummates his wish. It is not that I give these things only to those devoted to Me; I give, whenever it is necessary to turn the afflicted towards God." The Editor asked, "What is the power which works these miracles?" Baba answered, "It is wrong to call them miracles or Chamatkars or to say that Chamatkars are done in order to earn Namaskars! It is only Nidarsan (evidence) not Pradarsan (exhibition). It is just like a play, sport - My natural behaviour. It is a sign which helps to turn into faith, devotion, inquiry and realization of their own Atma. As the intention or the will arises in the mind, the thing is made! It is ready when I want it. The moment it is willed, the thing comes to hand or happens where I will it to happen." The Editor asked, "It is said that by miracles, things that are already somewhere are transported. Are they transported or created?" This is a question that many have longed to ask. Dr. K.M. Munshi, the founder of the Bharatiya Vidya Bhavan, a famous lawyer, statesman, and writer says, "Baba happened to perceive that my right hand was slightly trembling, as it always did on account of Parkinsonism. He rose from His seat, held my fingers, covered them with his own fingers, and rubbed them with sacred ashes, which came out of His hand. Then, He waved His hand with a sweeping gesture and materialized a ring, which He slipped on to the little finger of my right hand. I immediately perceived that the stiffness of the fingers had considerably disappeared; so had the slight trembling in the right arm and leg! When we bade Him goodbye, He again created sacred ashes and rubbed them over the right hand. Bringing a ring by apport did not surprise me; however, the sacred ash applied and produced by Baba must have weighed a pound a day, and could not have been stored somewhere else. If so, it is not apport, but something more." Dr. Munshi did not know that the Vibhuti created is more than a pound a day on busy days when grace flows profusely; it is also of many grades of smoothness, of many colours from white to dark brown, of many tastes, sucrose to bitter, and of many smells from rose to camphor and iodine! You cannot have all these varieties stored in such quantity, somewhere, and produced when willed! And, what exactly is apport? It is a word that only means, 'mysterious'. By using it, one can feel content that the miracle has been explained and understood! Howard Murphet, in his book, "Sai Baba, the Man of Miracles," writes, "The theory behind apports is that the object which is already in existence somewhere is dematerialized and brought in that state by psychic force to the place where it is rematerialized!" Very facile, indeed! As if that explanation is clear and convincing enough! I believe it is easier to produce a thing ab initio, rather than go to the botheration of dematerializing, transporting through long distance by psychic force exercised upon the dematerialized substance and again, rematerialize it! All in a trice, quicker than the speed of light! "They are all created newly. Transporting means, they should come from somewhere else, isn't it? That would be deceit. Things are created at the very moment I will them. I give also things that are found nowhere. This Power it is impossible to comprehend." I know many occasions when He created such new materials, like Sri Ramakrishna's portrait with Baba's own picture at the four corners and in the center; the miniature portrait of the Guru of the father and grandfather of Dr. Gokak, a Pantji of North Karnatak, created for him as soon as Baba saw his photograph in the shrine room of Dr. Gokak. The Editor asked further questions too. "From when have you begun to give these signs of divine power?" The answer was, "From childhood." "At school, I used to create chocolates, marbles, and other articles for the children around me." To make things clear, the Editor ventured to ask, "At what age did you acquire this divine Power?" Baba said, "From My very Birth," And, after a pause, He added with emphasis, "From before that," for, was He not at Shirdi as Sai Baba in the years before He incarnated in the Raju family at Puttaparthi? And was He not Krishna long before that? "That is to say, I resolved upon My Birth. I decided who should be My Mother. Mere humans can choose only who is to be wife or husband: the Mother was chosen by the Son in the Rama incarnation and in the Krishna incarnation. Then too, the task for which the birth was decided upon was, conferring Prema (Love) on all, and through that Prema, foster righteous living." "My acts are evidences of Divine Sakthi, signs and signals of Divinity. I am granting things out of Prema. My Prema will never diminish. I have no desire of any kind. I talk of Love, I guide you along the Path of Love, I am Love." Returning to Bangalore and Brindavan (Whitefield), Baba was busy with the Arts and Science College affiliated to the Bangalore University. The College was inaugurated on the 9th day of June, 1969. On the 18th, a gathering of poets met at Brindavan from all parts of Mysore, men who had attained renown as inspirers and interpreters of the Kannada-speaking region. Dr. D.R. Bendre, a fiery mystic emitting more light than heat, echoing in verse the tears and tragedies that soften the hearts of man, was there. He translated White-field as Panduranga, Pandu meaning White and Ranga meaning Field! That line sent a thrill among the thousands who heard him. Dr. V.K. Gokak who stands in the front rank of Kannada poets, and is a great name in English poetry too, was persuaded to read his poems. There were Dr. R.S. Mugali, a doyen of classical studies and romantic poetry; Professor G. P. Rajarathnam, an ardent student of Buddhism and Jainism, a popular poet delineating the feelings and aspirations of the common man; Professor R.G. Kulkarni, saturated with Aurobindo's Integral Yoga, Dr. G.S. Sivarudrappa, mystic and Sadhak, following the footsteps of the medieval saints of Karnatak but, nevertheless in touch with the heartbeats of Tagore and Gandhiji and Sri K.L. Sivappa, a warbler of the woods, free and bold, sweet and strong. When they had finished reading their poems, Baba sang a beautiful poem composed by Him on the Thandava Dance of Siva. It had all the rhythm, power and cosmic sublimity that words can limn, about that sempiternal Lila which swings worlds in space. Baba is the 'Kavimkaveenaam,' the Poet of Poets, an appellation ascribed to God in the Vedas. In the last week of June, Baba visited Madras. Devotees in their thousands flocked wherever He went and drank in the nectar of His discourses. Baba in His teens had mysteriously appeared at the bedside of a certain Loganatha Mudaliar in Madras and cured him of a brain malady brought about by black magic. "You are God," he said, holding on to the Feet of Baba. He decided to build a temple for Baba on his land at Guindy, a suburb of Madras, but, he had a dream wherein he was instructed to install, instead, the idol of Shirdi Sai Baba, the previous Body of Baba, therein. Baba too wrote to him, confirming the dream. So, the temple was built and in 1948 Baba Himself installed the idol! Howard Murphet, who visited the temple and saw the idol in 1968, writes, "Like Michelangelo's marble Moses in a little church in Rome, it gave me personally the immediate impression that It was alive." On the day of installation, the Mudaliars had the unique privilege and pleasure of washing the Feet of Baba and placing flowers upon them. 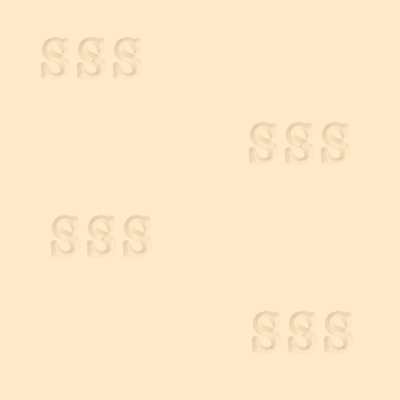 They prayed that they may be given an impression of the soles on a piece of silk, that they had brought for the purpose. Baba agreed and they applied sandal paste mixed with turmeric powder on the soles, and asked that he stand upon the silk cloth. Baba said, "Why My Feet? This day, I have installed here the Old Baba. I shall give you the Feet of the Old Baba Himself!"... and, then He stood on the silk cloth. When He stepped aside, the impression left was not of the slender, soft, rather teenage Feet of Baba, but, the long heavy ponderous Feet that walked the lanes of Shirdi, 32 years ago! Baba visited that temple, and addressed a large gathering of people there. 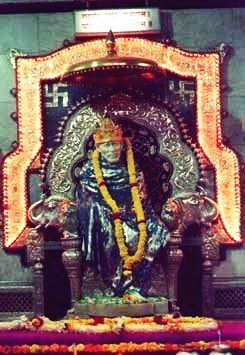 "This is a temple," He said, "where I have installed twenty one years ago, the idol of My Shirdi Form. 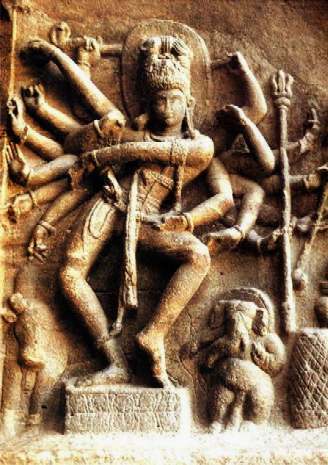 The word Vishnu is used for God, since it means , 'present everywhere at all times'. When people are told about an Idol of God, who is Vishnu, they laugh and condemn it as a foolish superstition. But, when it is desired to drink the ambrosia that is God, don't you require a spoon, a cup, or glass? The idol is a contrivance by which you can consume the Bliss. The cup can be of any shape or size or design; it is just a container of the Joy "Raso vai sah" - God is Ambrosia. He is sweet, sustaining, strength-giving. You can imbibe Him through a cup designed as Nataraja, or Durga, or Krishna, or Ganesa, or Linga, or Christ or Sai Baba. Many of you yearn for a cup shaped like this idol, designed as Sai Baba; so, I allowed you to have this idol, here. 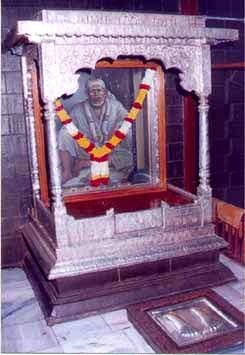 This is the Sai Form, which sat and taught at Dwarakamayi Mosque at Shirdi." "Start the day with Love, live the day with Love, fill the day with Love, spend the day with Love, end the day with Love, this is the way to God," He wrote. During the discourse that He gave that evening at the Prasanthi Nilayam, He warned against institutionalizing religion, and compartmentalizing society. 'It is good to be born in a church, but it is not good to die in it,' He declared. "One must travel beyond the limits set by mind and reason and reach the boundless expanse of the Absolute and the Eternal Atma," He advises. "He is in you as power, strength, love, happiness, enthusiasm, passion and compassion. Go into the deeper esoteric meaning of all the parables and metaphors. Brindavan is the jungle of Life; individual beings are the 'go', the cattle He tended, Go-kula is the herd of Jivis, Krishna is the Divine Principle that shines in every being, craving for the purity that is churned in the full of good thoughts and feelings. He guides and goads, He blesses and showers benedictions." The Vedas describe the Divine as the streak of lightning, flashing through the thick blue clouds! In Telugu streak is known as 'Geetha'. That Githa activates, illumines, and spreads splendour and wisdom. Since Baba has declared often that He is the indweller in all, listeners saw before them the Krishna Principle Itself embodied in the Sai Form, and bearing the Sai Name. It was an exhilarating realization. Whose swaying boughs whisper the ancient Om. And, I am Thine Own, Thyself! Whenever and wherever it is sure that one weakens in righteousness and a predominance of injustice does manifest, o descendant of Bharata, at that time I do manifest Myself. Anyone who knows as such of my divine birth(s) and activities will never, after leaving his body, take birth again, but will attain Me, O Arjuna. [As said:] By the unmanifest of Me this entire cosmic manifestation is pervaded, all living entities are in Me and I am not in them. The foolish look down upon My having assumed the human form, not knowing of My transcendental nature and that I am the Great Lord of all.